This is the formula that produced World Record Breaking Geraniums! 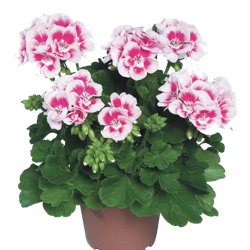 Geranium formula is designed to encourage the production of flowers - so use it on all your flowering plants! Great for growing Geraniums, Palargoniums, African Violets, Petunias, Impatiens, Hibiscus, and MANY other flowering plants all with richer more abundant blooms. For plants to flourish they need to be nourished. Using the right fertilizer and fertilizing regularly is important for optimal health and growth of your plants. When plants are well nourished they are more resistant to parasites and disease. AlgoPlus is a 100% water soluble liquid fertilizer. This 100% mineral based, balanced fertilizer is designed to deliver 12 essential nutrients and trace elements plants need to boost growth, flowering, and fruit. AlgoPlus is non-toxic, odorless, environmentally friendly and very economical. This non-burning formula can be used every time you water. Since the early 90's, AlgoPlus has become one of the best known natural fertilizers in the industry. 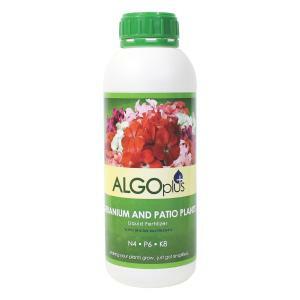 AlgoPlus uses only top quality, naturally occurring ingredients to make all the nutrients your plant requires to grow bigger and better available in one easy to use fertilizer. Whether you have a vegetable, flower, or hydroponic garden, or just want to maintain a beautiful lawn, we make fertilizing your plants with naturally occurring nutrients simple! Is AlgoPlus easy to use?